So sad to hear about the passing of Christine Brooke-Rose. What a radiant shining light glimmering above the slog! We can’t imitate the wordplay (“affrodizzyacts,” though we try). Her words: “Let us play: there are more theories in heaven and earth.” Her friend Roland Barthes’s words: “The writerly text is ourselves writing, before the infinite play of the world is traversed, intersected, stopped, plasticized by some singular system (Ideology, Genus, Criticism) which reduces the plurality of entrances, the opening of networks, the infinity of languages.” Who said it best? 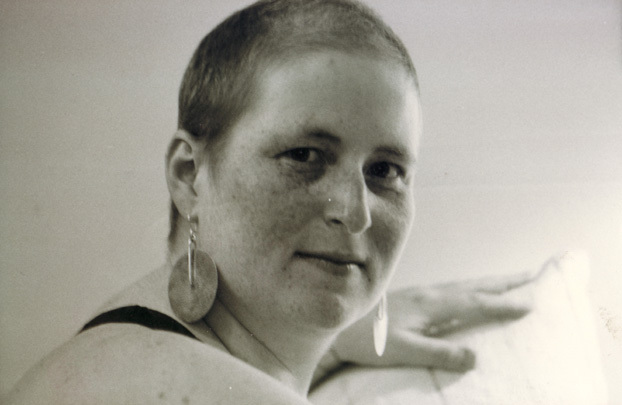 Amid the sadness, though, a chance to revisit the life: (we bullet) remembrances up at the Guardian (by Natalie Ferris), htmlgiant (by A. D. Jameson, along with a solid introduction to her work), and the PN Review. 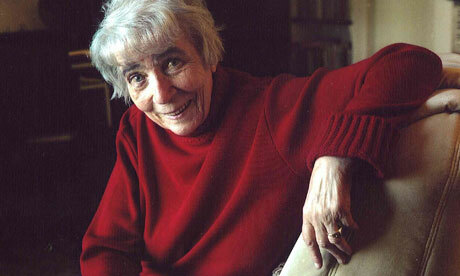 Lots of shout-outs popping up on blogs, like this lovely, brief post (“christine brooke-rose, rock star, wildwoman”) from writer-critic Kate Zambreno (who, like us, counted Brooke-Rose among her heroes) among all this, wonderful revisits of her novels and essays (Jameson is especially apt in calling-out Such (an imagined Oppenheimer-ian end-game) and Thru (better than William Gaddis rewriting J R as the collective sigh of a polyvocalized writing workshop); Zambreno points us to B-R’s essay “Illiterations,” . . .
PART I 1. “I’ve written a lot on Susan Stewart’s work, which takes as a starting point Marx’s notion that even the five senses are the product of historical forces—they have a history, and for Stewart poetry is a record of that history.”—Ange Mlinko, in conversation with Jordan Davis 2. Bill Berkson remembering John Ashbery in white denim (at the Poetry Foundation’s Alternative Press Original Multiples opening 22 September 2011) 3. The 1979 portrait of Walter Hopps that hung over Ashbery’s bar— 4. That Ashbery and Hopps must have passed each other at the opening of a show, somewhere (East Coast–West Coast; Ashbery writing for Art International and Art and Literature; Hopps curating at the Pasadena Art Museum and then the Washington Gallery of Modern Art and then the Corcoran; all of this, in time, between 1960 and 1972) 5. That Ashbery appears in an epigraph— 6. Students respond favorably to Levertov’s conviction that the poet writes more than “ knows.” 7. The Letters of Robert Duncan and Denise Levertov (Edited by Robert J. Bertholf and Albert Gelpi) 8. Duncan to Levertov: “I draw back from commanding conscience, as I would avoid whatever tyranny of the will . . . . . .
As an expression, the “Ides of March” entered our vernacular right around the rise of the modern. In ancient Roman daily life, the ides approximated mid-month—in particular, the ides of March heralded a feast day for Mars, god of war, often accompanied by a military parade. 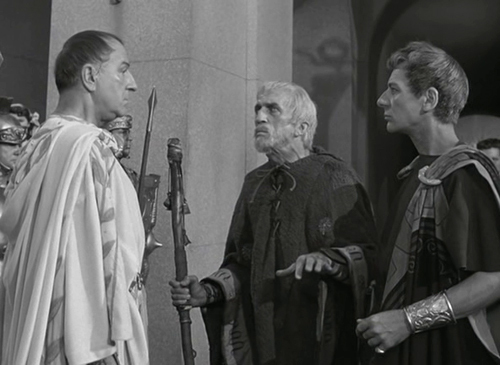 We associate it with the death of Julius Caesar, and with Shakespeare’s soothsayer, who intones near the opening of that eponymous play (Act I, Scene II): “Beware the ides of March.” Caesar, the Shakespearean character, of course dismisses the speculative fervor with a certain ease: “He is a dreamer; let us leave him.” We know how that story ends. The dream-life was a bit more Technicolored for medieval poets and bards, who took on the classical story of Caesar-the-superhuman’s death, and imbued it with portends better suited to middle times: Caesar’s horses stopped grazing and wept openly; a bull he recently sacrificed had no heart; a bird was torn asunder by birds of the same feather, while the Senate watched with eyes aghast; and flames lit forth from the palms of otherwise unharmed men. Soon, in epic poems, Caesar would mate with Morgan le Fay and produce the fairy king Oberon, while Chaucer would chronicle . . . 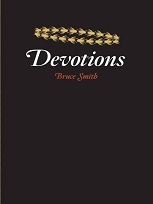 In the past few months, Bruce Smith’s Devotions has been nominated for the National Book Award (which went to Nikki Finney, for Head Off & Split), the National Book Critics Circle Award (which just last night went to Laura Kasischke, for Space, in Chains), and the Los Angeles Times Book Prize (which will be announced on April 20). 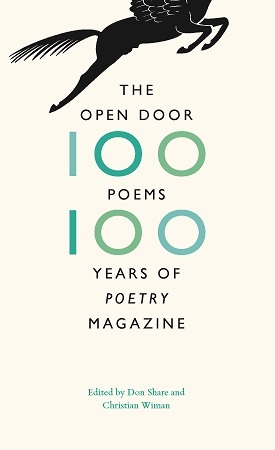 One of Smith’s previous collections The Other Lover (2000) was a finalist for both the National Book Award (taken home by Lucille Clifton’s Blessing the Boats: New and Selected Poems 1988–2000) and the Pulitzer Prize (awarded to Stephen Dunn’s Different Hours). Reluctant to turn to idiom (“Always a. . . .”), let’s shift to the book in question: “Write like a lover. Write like you’re leaving yourself for another. Write like you’re de Beauvoir, object and subject. Write like you must rescue yourself from yourself, become scrupulous to the body and the rain that floods you with rage and the crude sublimities: there was a lip print on the plastic glass wrapped in the misty domestic interior of the room. Write like there’s evidence, there’s tenderness, like Paris were the scene of a crime. A lipstick by the bed, a phone number, a . . .
It’s International Women’s Day, and after embarking on our own etymological lesson on the Middle English plural, we learned about “womyn’s” slip into print, through the works of Scottish writer James Hogg. Though his work was later championed by André Gide, Hogg was a bit of a bumpkin (eulogized by Wordsworth as the “Shepherd-poet,” but with a grain of salt under the tongue—see W.’s notes on “Extempore Effusion upon the Death of James Hogg” at the University of Virginia Library). The Private Memoirs and Confession of a Justified Sinner is a gothic metafiction at its best—”Sinners in the Hands of an Angry God” doing an H.P. Lovecraft short, as told to Umberto Eco, complete with editorial narratives and doubling anti-heroes—and the subject of some powerful thought by the late, great Eve Kosofsky Sedgwick (1950–2009) in Between Men: English Literature and Male Homosocial Desire. So, Hogg gave us “womyn”—and we run with it—but how else to celebrate the day? (Consider working with Kiva to microfinance a variety of projects for/by women across the globe?) Jessa Crispin, founder of Bookslut, celebrated with excitement about our recently released book by Jacqueline Rose, Proust among the Nations: From Dreyfus to the Middle East. Proust . . . Consider the house. The good doctor (a nephrologist!) Edith Farnsworth first commissioned architect Mies van der Rohe to construct her one-room weekend retreat adjacent to the Fox River at a dinner party in 1945. Farnsworth had earlier purchased the land that became the lot that became the Farnsworth House from Colonel Robert R. McCormick, then-publisher of the Chicago Tribune (heralded by political cartoonists of the day as Colonel McCosmic—a Commie-chasing, New Deal-loathing, socialism-fearing, World-of-Nations-knocking isolationist unlikely to syndicate Eleanor Roosevelt’s column “My Day” anytime soon). Is there an adage about dinner parties? Things between Edith and Mies didn’t really work out. It’s a complicated story involving malpractice suits; transparency in the client-architect relationship; escalating construction costs due to scarcity of materials, fueled by the Korean War; and the larger, nationally staged social dramas of the McCarthy era, in one case manifesting in vitriol from House Beautiful magazine. 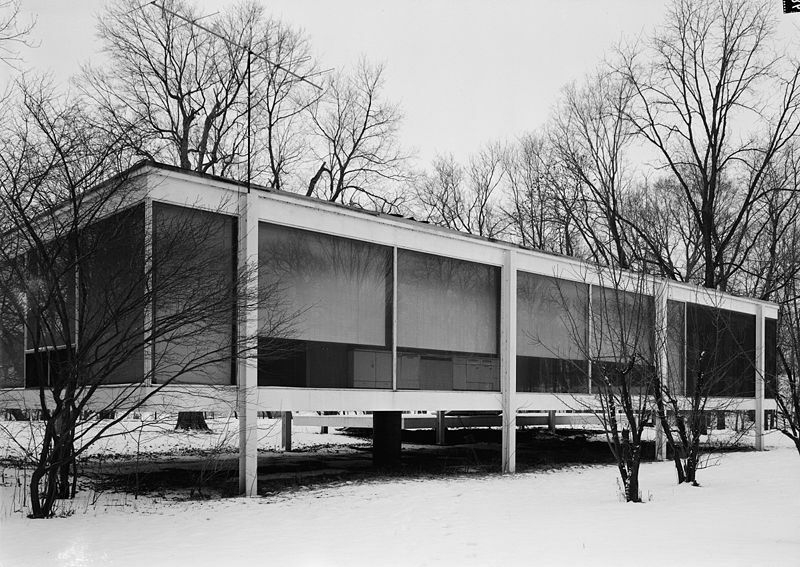 Prior to the clamor, previous to the house’s completion in 1951, and before dear Edith sold the house to Lord Peter Palumbo, took off to Italy, and began working with Eugenio Montale, a model version of the Farnsworth House was included in the 1947 MOMA exhibition (#356) “Mies van der Rohe,” organized . . .